Spanish cabalist of the thirteenth century; pupil of Jacob ha-Kohen of Provence. 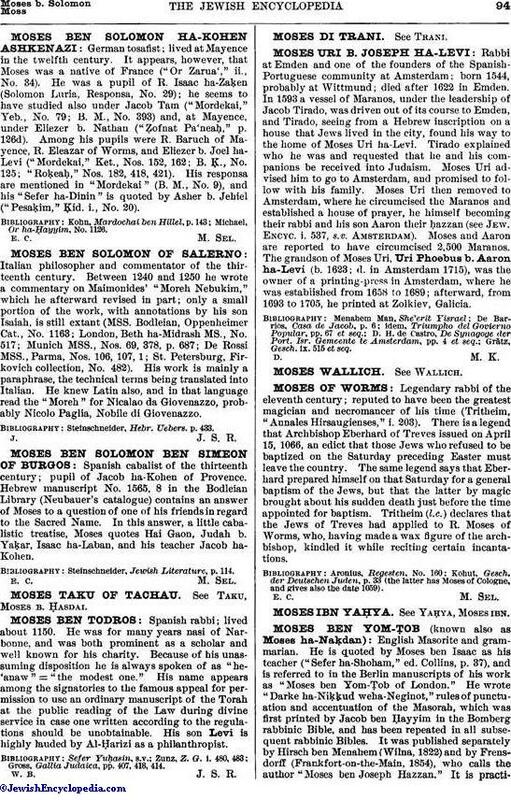 Hebrew manuscript No. 1565, 8 in the Bodleian Library (Neubauer's catalogue) contains an answer of Moses to a question of one of his friends in regard to the Sacred Name. In this answer, a little cabalistic treatise, Moses quotes Hai Gaon, Judah b. Yaḳar, Isaac ha-Laban, and his teacher Jacob ha-Kohen. Steinschneider, Jewish Literature, p. 114.